Nice pair of WH (Luftwaffe) FLAK shoulderboards as intended for a 'Soldat der Flakartillerie'. The straps measures approximately 11 cms in length. 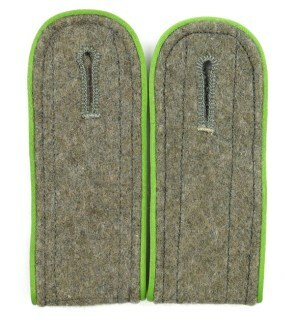 A very nice pair that can easily be used to complete a Luftwaffe Tunic (ie. Fliegerbluse) with! DJ (Deutsche Jugend) 'Oberjungzugführer' armbadge (Ärmelabzeichen). The badge is having its original RZM etiket ('A-Stück') attached. Nice original badge in good condition! DJ (Deutsche Jugend) 'Oberhordenführer' armbadge (Ärmelabzeichen). The badge is having its original RZM etiket ('A-Stück') attached. Nice original badge in good condition! DJ (Deutsche Jugend) 'Hordenführer' armbadge (Ärmelabzeichen). The badge is having its original RZM etiket ('A-Stück') attached. Nice original badge in good condition! DJ (Deutsche Jugend) 'Jungenschaftsführer' armbadge (Ärmelabzeichen). The badge is having its original RZM etiket ('A-Stück') attached. Nice original badge in good condition! 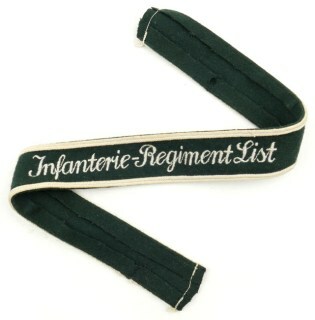 WH (Heer) Gebirgsjäger Armbadge, executed on early dark-green wool, showing the famous 'Edelweiss' flower. There is some minor moth damage. Nice original example in mint and unissued condition! WH (Heer) Officer's breast-eagle, shoulder-boards and collar-tabs as intended for a 'Oberleutnant der Pioniere'. This set would be perfect for restauration of an officer's tunic or to add to any insignia collection. Nice original matching set in good, clearly used and tunic removed, condition! WH (Heer) metal breast-eagle as intended for the white summer tunic (Hoheitsabzeichen). The eagle is not visible maker marked. The tombak eagle still retains some of it's original finish and is showing a nice age-patina. Nice original example in good used condition! 'Bahnschutz' sleeve-eagle (Ärmeladler), these are often sold as early SS-VT eagles, it however is most likely just a left-facing 'Bahnschutz' sleeve eagle. The eagle is nicely machine-embroidered in silver-grey coloured on a black woolen backgrond. Nice original eagle in good unissued condition! 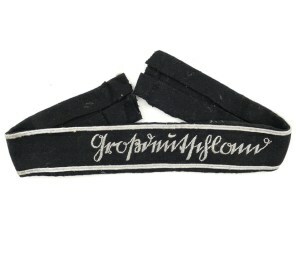 This is a nice Hitler-Jugend Member's Armband (Armbinde) as worn by HJ members on the upper left sleeve on almost all HJ uniforms. The armband shows some little staining and damages caused by usage. With RZM etiket. Nice original armband in good used condition! 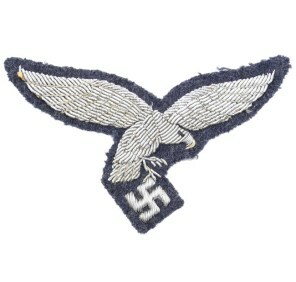 This is a nice example of a 1st pattern hand-embroidered WH (Luftwaffe) Officer's breast-eagle. The eagle is in very good, although clearly used and tunic removed condition, perfect to restore a used and worn Luftwaffe officer's tunic with! Waffen-SS arm-chevron intended for a 'Sturmmann', this is the tropical version. 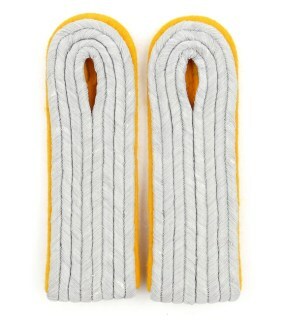 The chevron is executed in black wool having the yellow-coloured, sub-dued, NCO braid with two black lines. Nice original example in mint and unissued condition! Wehrmacht (Kriegsmarine) 'Küstenartillerie' breast-eagle (Hoheitsabzeichen). The eagle is executed in the neat so-called BeVo weave style in golden-yellow thread on a dark-green linnen background. Nice example in good unissued condition! 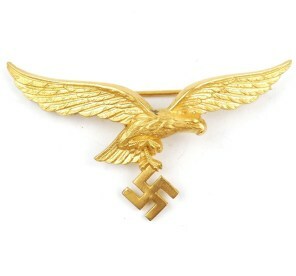 Waffen-SS ('tropical') golden-yellow coloured sleeve-eagle (Ärmeladler) executed in BeVo-weave pattern. The eagle is complete with it's original RZM etiket ('A-Stück'). The eagle is a bit wrinkled caused by years of storage. Nice original example in good unissued condition! 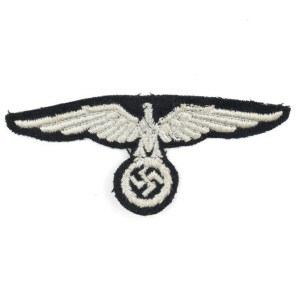 This is a nice Hitler-Jugend Member's Armband (Armbinde) as worn by HJ members on the upper left sleeve on almost all HJ uniforms. The armband shows some little staining and damages caused by usage. Nice original armband in very good condition! Tan-coloured NSKK arm-eagle. Neatly woven in the so-called 'flat-wire' weave technique. The eagle is complete with it's original RZM etiket ('A-Stück'). Nice example in very good condition! WH (Heer) TSD officer's shoulder-boards and collar-tabs as intended for a 'Hauptmann der Truppensonderdienst'. The collar tabs are executed in 'BeVo'-weave technique. Nice original matching set in very good, clearly used and tunic removed, condition! WH (Heer) 'Sanitätsunterpersonal Abzeichen' (Medical Personnel's Trade Badge). The patch is showing a neatly hand-embroidered Asklepian in golden-yellow linnen on a field-grey wool base. Nice original badge in good condition! 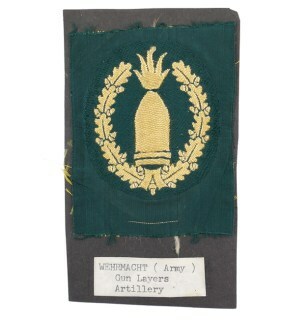 Wehrmacht (Heer) Artillery Gun-Layer armbadge (Abzeichen für Richtkannoniere der Artillerie). 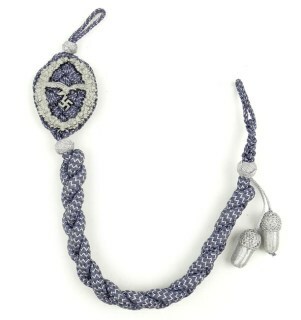 The armbadge is executed in the so-called BeVo-weave. The badge has been cut-out from a souvernir-/photo-album and is still pasted on a piece of carton. Nice badge! Reichsbahn M44-type arm-eagle (Hoheitsabzeichen). The eagle is executed in the neat so-called BeVo weave style in yellow thread on a black linnen background. The eagle is nicely marked with 'BeVo-Wuppertal'. Rare original M44 Reichsbahn arm-eagle! This is a nice red coloured, linnen-based armband (Armbinde), these armband were worn by the SA Military defense training groups (SA-Wehrmannschaften). The armband is complete with it's original RZM etiket ('B-Stück'). Nice original armband in good used condition! 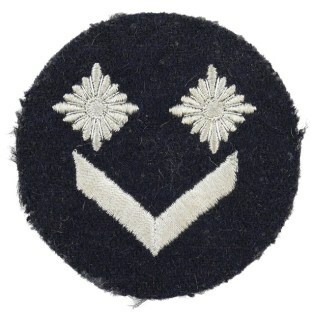 WH (Luftwaffe) Gefreiter's Rank Chevron (Armwinkel). 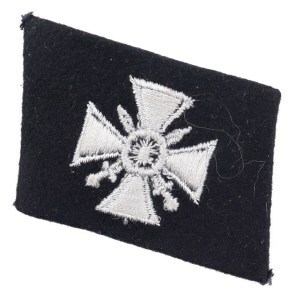 The chevron is executed in grey Luftwaffe cloth and has one band of silver-grey NCO braid indicating the rank of 'Gefreiter'. Nice example in good unissued condition! This is a nice original golden-yellow-coloured linnen 'Deutsche Wehrmacht' Armband (Armbinde). 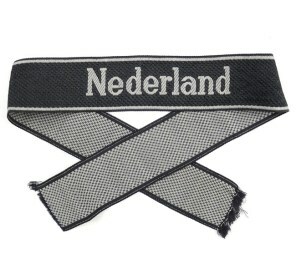 The armband is executed in a technique similar to the 'BeVo'- weave technique. Nice original armband in good used condition! 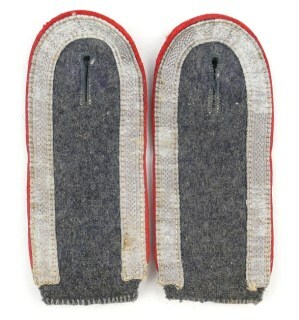 WH (Heer) pair of officer's shoulder-boards as intended for a 'Leutnant der Kavallerie'. The boards, which are constructed from the golden-yellow coloured 'smooth' type wool are complete with their original tongues. Nice original pair of Cavalry Officer's shoulder-boards! Waffen-SS 'Latvian' Volunteer Sleeve Shield as intended for members within the '15. Waffen-Grenadier-Division der SS (lettische Nr.1)'. The shield is in mint and unissued condition and just shows some minor traces caused by years of storage. Nice original sleeve shield! Waffen-SS Armourer NCO's Sleeve Diamond (Ärmelraute für Waffenunterführer). Machine-embroidered lightning blitz in silver-white linnen on a black wool diamond shaped base. Nice example in good unissued condition!